Information literacy in prisons is still an incipient issue for the scientific community, as evidenced by the absence of studies on information literacy activities in prisons. 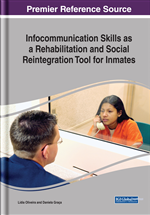 There are hardly any specific training programs for the acquisition of informational competences in Spanish prisons. They are presented results of research that have been aimed at creating a theoretical-application model of training in informational and digital skills for people in prison. The project had a methodological approach based on action research. The digital divide makes it difficult to integrate people into the labor market, leading them to social exclusion. In the case of female prisoners, this gap is even more accentuated and integration difficulties increase, so the project has adopted a gender perspective. In order to meet the objectives, a training program aimed at social and labor inclusion was created with the aim of improving the living and working conditions of women prisoners and increasing their participation as active citizens in the information society. The research we present is a response to the lack of informational literacy training programs for the social inclusion of women prisoners in the jails of the Community of Madrid (Spain). The economic and gender gap hinders the integration of these women in the labour market and leads them to social exclusion. If we add to this the informational and digital gap, we are facing a serious case of social exclusion. That is why the objective of this research has been to develop a formative proposal of information literacy for social inclusion, with the aim of allowing inmates to acquire the necessary information and digital skills for their social and educational development from the perspective of social and labour inclusion, thus improving their living and working conditions and increasing their participation as active citizens in contemporary society. First of all, in order to achieve our objective, an analysis of the general and specific environment has been carried out, which has allowed us to define the context for the implementation of our training proposal. The review of the literature and the experiences found related to our object of study has allowed us to determine the need to produce a training program for the acquisition of informational and digital competences in the female prison context. In addition, in order to elaborate our proposal, we have relied on the theoretical framework of information literacy for social inclusion and the collection of data through a user study conducted directly to the inmates in our case study. The analysis of the collected data reflected relevant facts, which showed that the inmates had a very low level of computer and informational knowledge. This study has allowed us to develop a training proposal according to the specific needs of our study group. Our proposal includes training in informational and digital competencies for the social inclusion of women inmates of the “Jaime Garralda” Mothers Unit in Madrid, a prison in which women who have just been mothers living with their children remain for up to three years. With our work we intend to contribute to diminish the informational and gender gap suffered by these women, facilitating their integration into society and allowing them to take advantage of all available resources, so that they can relate, work, communicate, entertain, produce, and access administrative procedures. It is also intended to facilitate that woman prisoners are more autonomous, economically independent, more critical and more reflective, that is, in short, more socially and professionally integrated. This work that we present here emanates from the doctoral thesis carried out by Agúndez-Soriano and directed by Cuevas-Cerveró in 2015 in response to the lack of information literacy training programs for the social inclusion of women prisoners. Information Literacy whose acronym is ALFIN, is a translation of Information Literacy and alludes to the ability to determine what information is needed and when, how to find it, evaluate it, recover it and communicate it, in an autonomous way and making an ethical and responsible use of it. In the mid-90s there began to be a connection between the concept of information literacy and education. Authors such as Johnston and Webber (1999) cited in Bawden (2002), argue that information literacy should be treated as an academic discipline and that is how it should be taught. In this way, there begins to be a close relationship between permanent learning and information literacy, which points to continued learning for the acquisition of informational knowledge with a view to informational literacy of people. One of the most cited definitions at the international level is the American Library Association (ALA) defines the literate person informationally saying: To be competent about the information an individual must recognize when it is necessary, and have the ability to locate, evaluate and use effectively the information that is required ... People prepared in this aspect is, finally, the one that has learned to learn. They know how to learn because they know how information is organized, how to find it, and how to use it so that others can learn from them. They are people prepared for lifelong learning because they are always able to get the information they need for any task or decision that comes their way. (ALA, 1989). For its part, the European Union (2006), again relates information literacy with continuing education, in its “Action Program in the field of lifelong learning” 7 where it points out that new technologies are a tool that can lead to inclusion and that, therefore, people who do not use them are excluded from a society that is increasingly digitalized. Information Literacy: Crucial skill in the pursuit of knowledge. It involves recognizing when information is needed and being able to efficiently locate, accurately evaluate, effectively use, and clearly communicate information in various formats. Increasingly, information is available in unfiltered formats, raising questions about its authenticity, validity, and reliability. This abundance of information is of little help to those who have not learned how to use it effectively. Social Inclusion: Is the act of making all groups of people within a society feel valued and important. The provision of certain rights to all individuals and groups in society, such as employment, adequate housing, healthcare, education and training, etc. Prisons: A prison, also known as a correctional facility, jail, gaol, penitentiary detention center or remand center is a facility in which inmates are forcibly confined and denied a variety of freedoms under the authority of the State. Female Inmates: They are women deprived of freedom, generally in prisons, for having committed some type of crime. Action Research: Is a disciplined process of inquiry conducted by and for those taking the action. The primary reason for engaging in action research is to assist the “actor” in improving and/or refining his or her actions. It is an empowering experience. Action research has this positive effect for many reasons. The most important is that action research is always relevant to the participants. Relevance is guaranteed because the focus of each research project is determined by the researchers, who are also the primary consumers of the findings.